Tekmap Consulting is pleased to announce the delivery and installation of EarthNav Lite, a custom and interactive, three-dimensional Geographic Information System (GIS) to view, manage, analyze, and query 3D-geographic data. The installation also included high resolution (<1m) client data. EarthNav Lite lets you merge and overlay custom, high resolution, geographic data, with the NASA World Wind virtual globe. By merging your custom data with the virtual globe, you get true elevation data that you can view from different perspectives, get 3D-geographic coordinates, overlay models and vectors, view elevation profiles, and save screen shots. By combining your custom data with the NASA World Wind virtual globe, EarthNav Lite provides you with a powerful, interactive 3D-viewer. EarthNav Lite is a Java-based application developed by Tekmap Consulting that incorporates the functionality of the open source NASA World Wind software development kit (SDK). The National Aeronautics and Space Administration (NASA), along with its partners and the open community, developed the World Wind SDK. 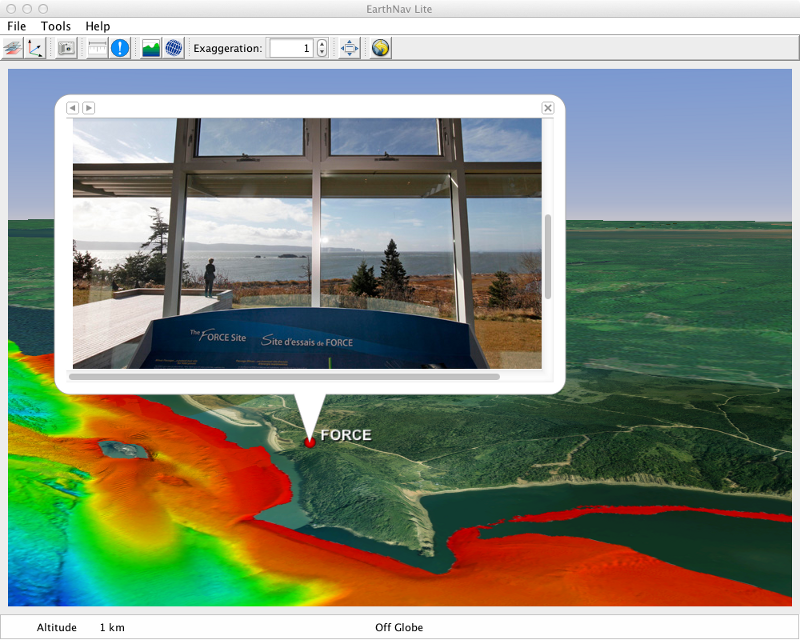 EarthNav Lite is supported on Mac OS X, Windows XP, Windows 7, Windows 8, and Linux. Providing built-in high resolution Client elevation data that are merged with the existing digital elevation model of the NASA World Wind virtual globe. Providing built-in high resolution Client imagery data that are draped over the NASA World Wind virtual globe. Using the Layers Manager to organize data layers and to easily turn them on and off. Using the 3D-View Manager to record, organize, and delete 3D-views. Using the tools in the EarthNav standard toolbar to measure the distance between points, query points, view elevation profiles, turn graticules On/Off, adjust the vertical exaggeration, and reset the virtual globe. Viewing Keyhole Markup Language (KML) and Keyhole Markup Language Zipped (KMZ) overlay files. Saving and opening 3D-view files. Saving screen shots of the World Wind virtual globe to an image file. Exporting query points to comma-separated and text files for use in a GIS, text editor, spreadsheet, and similar programs.